There’s no consensus about what to call a gathering of bishops. A sea of bishops. A bench of bishops. A psalter of bishops. Any of the three answers are acceptable. When 127 bishops gather in the Diocese of Fort Worth on Sept. 20 – 23, the accurate terminology will not be in dispute: V Encuentro. This “Fifth Encounter” will include more than 2,600 national delegates, at least three Vatican representatives, and the large collective of bishops mentioned above. Representatives of more than 100 U.S. Catholic organizations, including Catholic Relief Services, Catholic Charities, and the National Federation for Catholic Youth Ministry, are expected to attend. 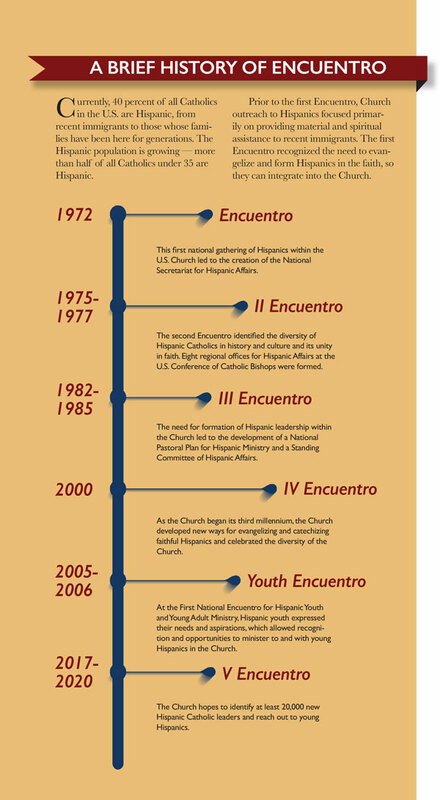 The purpose of this national Encuentro, and the four preceding Encuentros, is to determine how the Church can better minister to the Hispanic population, and how the Hispanic population can more fully engage with and serve the entire Church. The first step is to enter into a deeper relationship with Jesus Christ and His Church, becoming Missionary Disciples: Witnesses of God’s Love, which is the theme of V Encuentro. The gathering is the culmination of 18 months of meetings. Nearly 250,000 people assembled in parishes, participating in faith development, consultation, and outreach to those who have left or never belonged to the Church. Delegates from those parishes shared their experiences and concerns at one of 145 diocesan Encuentros. 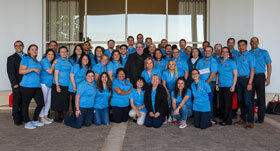 And between January and June of this year, 14 regional Encuentros met across the U.S.
At the national gathering in September, participants will listen to keynote speakers and choose from among 30 or more workshops on subtopics such as engaging youth, developing leaders, and family faith formation. As the host diocese, Fort Worth faithful have been preparing for the National V Encuentro for two years, working with the U.S. Conference of Catholic Bishops on advanced logistics for the four-day event. During the assembly, Bishop Michael Olson will give the welcoming address and lead a morning prayer service. The Diocese of Fort Worth is providing and coordinating the 300 volunteers, recruited from the Knights of Columbus, deacons and diaconal candidates, seminarians, and the faithful of the diocese. People who are not attending V Encuentro but are interested can watch keynote addresses, important plenary sessions, and liturgies online. Some of the speakers will be broadcast live on EWTN. The Grapevine conference is not the culmination of V Encuentro, but rather the transition between accumulating the best practices of Hispanic ministry and then implementing those ideas back in the parishes. According to Marlon De La Torre, diocesan director of evangelization and catechesis, the Diocese of Fort Worth will participate in the National V Encuentro with a focus on developing a Hispanic pastoral plan for this diocese. He anticipates the core of the three-to-five-year diocesan plan will be on strengthening the family. “The family serves as the fulcrum and the centerpiece of formation across all levels and all generations. We want to be sure Mom and Dad see themselves first as formators in the faith of their children,” De La Torre explained. The Hispanic community in the Diocese of Fort Worth is a diverse community with distinct generations and varying countries of origin, but the Catholic faith unifies us, according to De La Torre. There’s no consensus about what to call a gathering of bishops. A sea of bishops. A bench of bishops. A psalter of bishops. Any of the three answers are acceptable. When 127 bishops gather in the Diocese of Fort Worth on Sept. 20 – 23, the accurate terminology will not be in dispute: V Encuentro.